Award-winning garden – A very happy customer! It’s not because we are arrogant that we often tell our prospective customers (or anyone that will listen!) 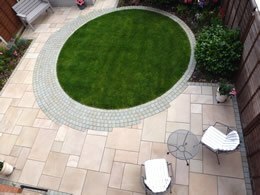 that we are a multi award-winning landscape company… it’s because we are incredibly proud. It demonstrates our level of expertise, quality and skill. Our ability to create amazing gardens cannot be brought to life more than when our customers tell us. That’s why we wanted to share Linda Fullforth’s story with you, in her very own words. “I was provided with three companies, and all came to quote for my new garden. I explained what I wanted, and Aura Landscapes were the only one to actually provide me with a detailed drawing, showing a very detailed design, so that I would know what the finished garden would look like. None of the others did this. In addition to that, the owner, Mike, was so passionate about it that I knew they would be the right choice. My decision wasn’t based on cost; but getting the right company for me. It was really important to me that I was kept informed throughout the building process and I didn’t even need to ask. The team were polite and friendly and consulted me regularly. During the time they were working here, I built up a good relationship with them, and trusted them implicitly. When my garden was complete, I was so happy. It exceeded my expectations. What I love is that I have different places to sit, depending on what time of day it is, and where the sun is. This is the value that Mike was able to add, as this wasn’t even in my thinking when I was first designing the garden myself. And he worked around my needs, because I was very keen to keep some of my plants. They have remained a feature in my garden, which is fantastic. I later heard that my garden had been nominated for a National Marshalls Award! I have to say, it is a very special garden, so I wasn’t surprised, but absolutely delighted. And when I then learned that it had won, I was a little smug! Thank you to Linda Fullforth for sharing her story with us. We are honoured to have produced your garden for you. To view more of our projects, click here.